An independent commission must investigate the escalating violence in Nigeria. 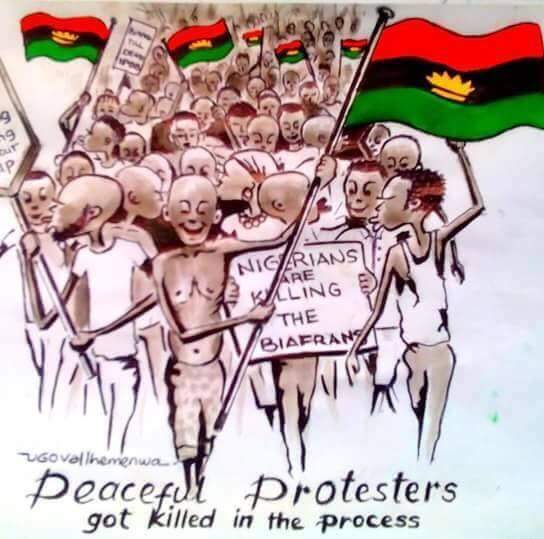 After the violent death of at least 35 Biafrans in southeastern Nigeria, died during the repression of IPOB hereos day by the nigerian police and army on Monday, May 30, the Society for Threatened Peoples (STP) has called for the establishment of an independent commission of inquiry. We must therefore independently clarify who is responsible for the use of heavy ammunition and why it was decided to shoot at biafran peaceful and unarmed protesters. If the government of Nigeria is not prepared to carry out investigation, we will ask the High Commissioner for Human Rights of the United Nations to clarify the reasons behind the escalation of violence by the Buhari led administration. Impunity will only feed more violence in Biafra. The mass killings of innocent Biafrans is unjustifiable. Background of the rally were the celebrations for the 49 anniversary of the declaration of independence of Biafra from Nigeria on 30 May 1967. The activists had called for in the Biafra we gather in prayer meetings in churches and public events. The nigerian security forces have also penetrated the churches and arrest and killed some biafrans while they were sleeping. The most serious incidents occurred in the city of Onitsha in the federal state of Anambra. Here at least 30 people were killed. After this new escalation of violence the perpetrators, the Nigeria security forces must not remain unpunished otherwise the entire south-east of Nigeria is likely to fall in violence in 2017, when they will be remembering the 50th anniversary of the start of the genocide in Biafra against the biafrans.